And maybe one you shouldn’t. 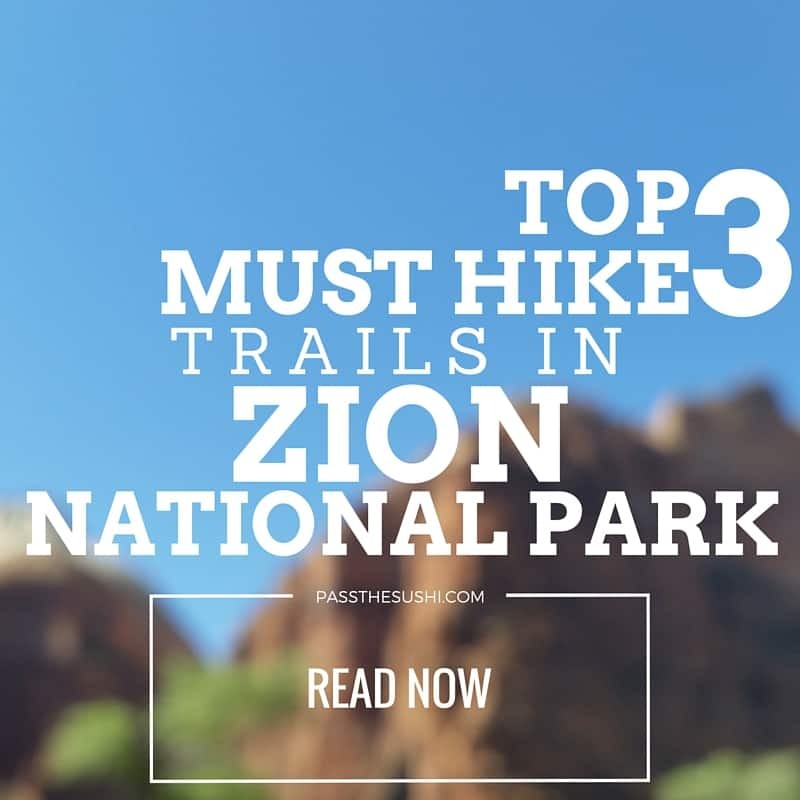 Been itching to go to Zion National Park? It’s more breathtaking than pictures lead you to believe with ancient rock formations jutting up into the skies filling the horizon with unimaginable landscapes. It is an intoxicating place that quickly humbles you with its views and size. It is also a very heavily traveled park and without a little warning, you may not know what you are getting into when you embark on some of the hikes. I could have spent a week just exploring the views with my camera pack, but sadly, I only had 4 days, so I made the best of it and scratched off the 3 must hike trails of Zion. Exploring our great national parks is no joke and Zion is one that you should be sure to not miss. With stone carved from thousands of years of rushing waters, it’s an adventure lover’s dreamland. The moment I laid eyes on the peaks of Zion, I wanted to run from an hour before sunrise to long into the blue hour with my camera snapping everything I could (I may have even gotten up at 3AM and worked on a little star photography too). I got in a few killer hike, made some great friends, and reignited my love of camping. Now, I pretty much can’t wait to get back (and plan on adding a drive through Arches to the agenda as well!). 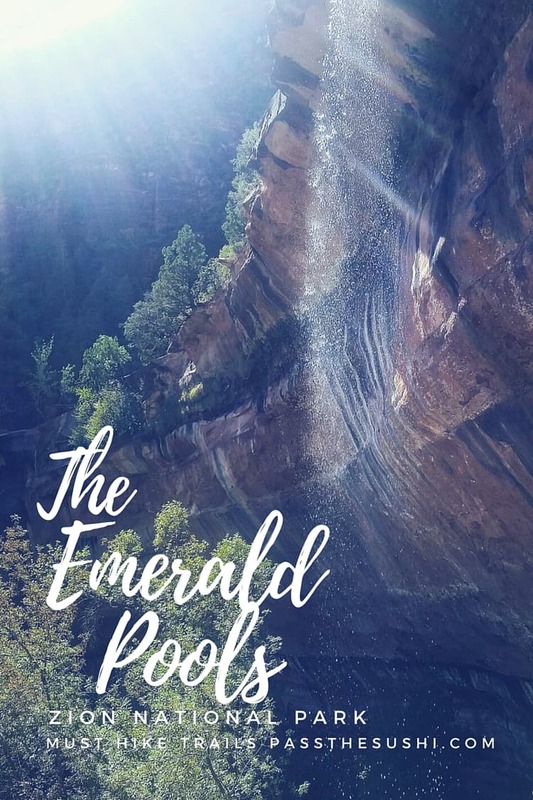 Zion is beautiful and it’s easy to see why so many people make the trek into this national treasure every year, but it is in the desert of Utah and important to remember, even on the simplest of hikes, to be prepared. Bring plenty of water, wear the right shoes, be smart. 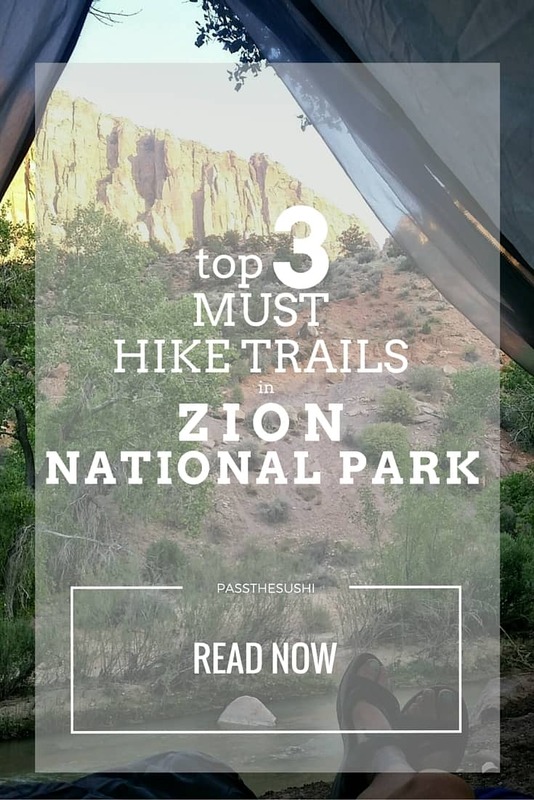 Luckily, Zion has trails for all skill levels and even a beautiful road that passes through offering scenic stops as well. There are three stops on this short and relatively easy hike, allowing you to customize it. Each of the pools offers a glimpse into what’s next with each pool getting a little better than the one before (even in dry season, when I went). When it rains, these pools fill creating stunning small ponds that I saw people splashing around in. For hiking, there are a few short bursts of ups. If you are unsteady, bring a trusted walking stick, but overall, this is a very easy hike with perfect views of the hidden smaller enchantments Zion has to offer. 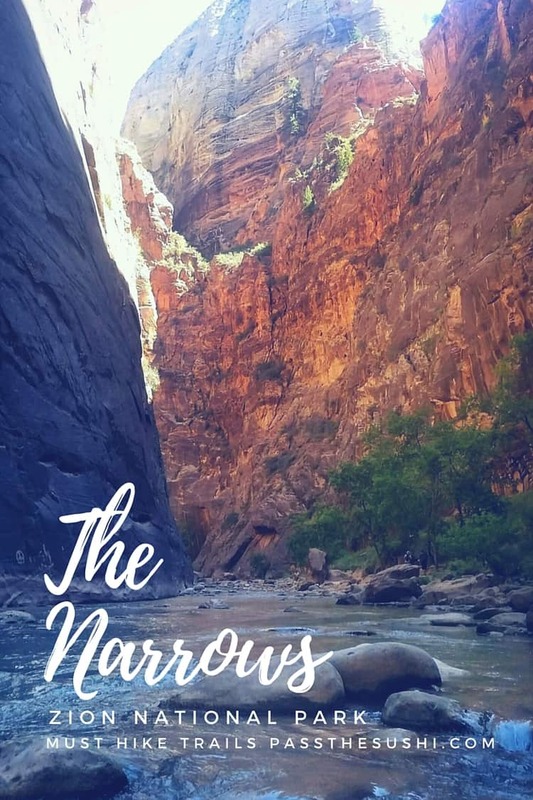 The Narrows can be hiked Top to Bottom (with a permit) or from the Bottom Up and can be as long or as short as you like. The level of the water has a lot to do with how far you are probably going to venture. With thousands of smooth rocks under the flowing current, getting good footing can be a little tricky as you start out. Wearing good water shoes will help a lot when taking on The Narrows. The friend I traveled with, a Colorado resident and avid outdoors lover, told me to try to keep soft knees as I walked through the water that at times was up past my knees and pushed me, sending me almost toppling over once or twice. Pack a few snacks (I love beef jerky) and plenty of water as you may walk a lot further than anticipated if you are lured in and can’t help but discovering what’s around the next bend. The further you go, the more it seems to thin out, so if you are able and willing, this is a hike that is worth every moment of possibly waist-deep water. The Narrows and its water are all subject to the weather. Always check the weather before venturing out on a hike. Truth, I do not think you should hike Angels Landing. This isn’t some reverse psychology technique where I then spend the next 5 paragraphs telling you why you ‘shouldn’t’ leaving you wanting to rush out tomorrow and head to Zion. No, I am stone cold serious. 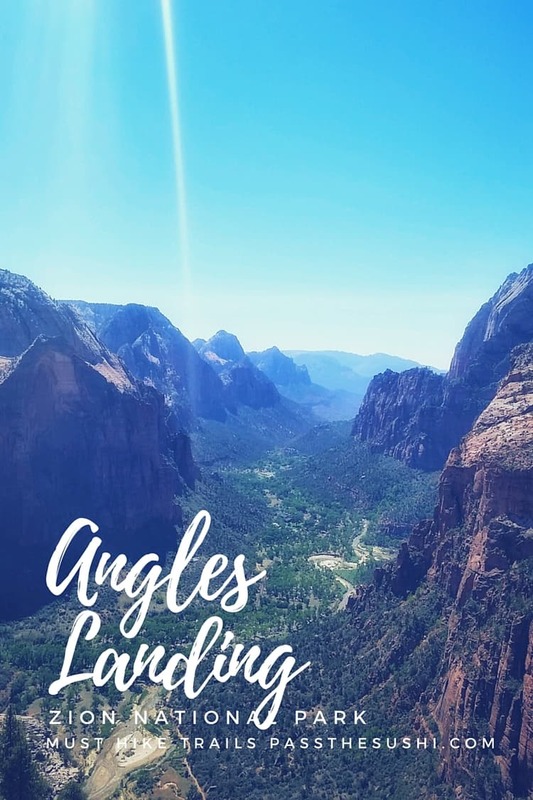 Angel’s Landing is a relatively short hike, coming in at 5 miles round trip but it is rated hard and here is why. Something like 21 switchbacks straight up the peak. So, 2.5 miles up. And at mile 2 things start to get really really tricky. Everyone who has come to Zion is going to attempt to hike Angels Landing and when you have that many people on a narrow trail, things are just going to get aggressive and rude. Now you have people in a hurry trying to hike in the heat on a very very narrow ledge 1800 feet up. When I say narrow, I mean, narrow. There’s a chain bolted to the rocks and only one person headed up on heading down can be in any one spot at one time – meaning often times rather dangerous maneuvers are being made to allow one to pass. I did it, I hiked it and took the selfie at the top. But, in hindsight (and yes, getting down was actually harder than going up that last .5 miles) I wouldn’t recommend it to the general public. In private groups, or if only X number of people were permitted on the trail at once, then sure, tackle it. Tackle it on a day when no one else is climbing it. But on the days when it’s crowded, it’s crazy. And even alone, there were several questionable foot placements and moments where if I had stopped to think about what I was doing, I would have really been in trouble. Should you hike it, bring a sturdy set of collapsible walking sticks to help steady you over some of the early pitches. Once you get past mile 2, you will most likely need to put them away and use your hands for a lot of the maneuvering. I saw people walking it in flip flops, without water, in the September heat. I saw fit athletic perfectly healthy grown men shake and people need to sit from the oppressive heat that snuck up on them. It seems like such a short reasonable hike to scratch off the bucket list, but there are thousands of impressive views in this park. Hunt those out. Take your time and enjoy them. Did I miss an epic hike that I need to try? I would love to hear your camping stories for this great national park! Chime in below and or follow the conversation over to Facebook!